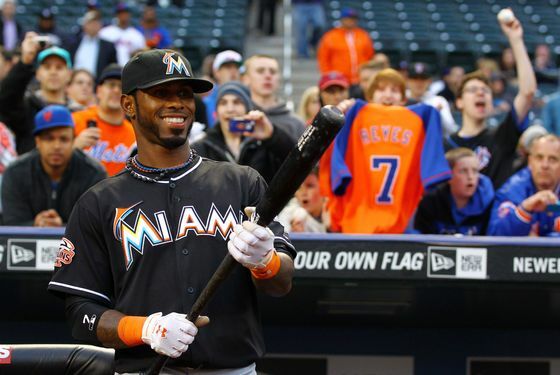 Earlier this month, the news spread that the Mets would play a video tribute to Jose Reyes before the shortstop’s first game at Citi Field as a member of the Miami Marlins. It was a nice gesture by the Mets to decide to recognize one of the most dynamic players in franchise history, but reaction to the plan was mixed. Some liked the idea of acknowledging Reyes, one of the most popular Mets in recent memory, while others weren’t crazy about the idea. Reyes, of course, left during free agency for a big payday in Miami, but there was also little chance the Mets, given their current situation, would make him a competitive offer. So whether or not Mets fans have issues with Reyes really depends on which Mets fan you ask. Indeed, when Reyes came to bat in the top of the first last night in his first game back at Citi Field, he got a mixed reaction: Some fans booed, but some gave him a standing ovation. (There’s actually some debate today over the ratio of boos-to-cheers. If you were among the 20,192 in the stands — that’s the smallest announced crowd of the year, by the way — feel free to chime in down in the comments.) The video of highlights from Reyes’s time with the Mets that played on the Citi Field scoreboard last night — one that ended with the phrase “Thanks for the memories!” — is below. Reyes, by the way, went 0-for-4 in the 2-1 Mets win.